No One Sells More The Southern Tier Homes Than The Steve Kettelle Team! The average Realtor sells 6 or 7 properties a year, yet we transact well over 100, year after year. How do we do it? We each have roles, so we get very proficient in our area of specialty. We area always sharing information with each other, keeping each other up-to-date on all matters affecting your purchase or sale. We market the heck out of your home! with a 150+ step process to reach as many buyers as possible, we feel we do more for our sellers here locally. We are super active in our community, local Chambers of Commerce, events, fundraisers. We hold over 375 Open Houses per year! We give back to the community that has made us the success that we are, on a regular basis. We build relationships with you, as we want to be your Realtor for life, not for this one transaction. 5 DIY Projects To Update Your Southern Tier Home. Elmira-Corning listings last updated Apr 24, 2019 4:14:am. Not just a single agent, but 6 highly trained team members who work together to make your home buying or selling experience the very best it can be. 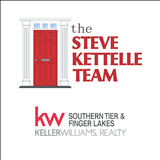 No One Sells More Southern Tier Homes Than the Steve Kettelle Team!